A) Crossbars are to be 3/4" (19 mm) diameter, anodized aluminum rods, with ends rounded. 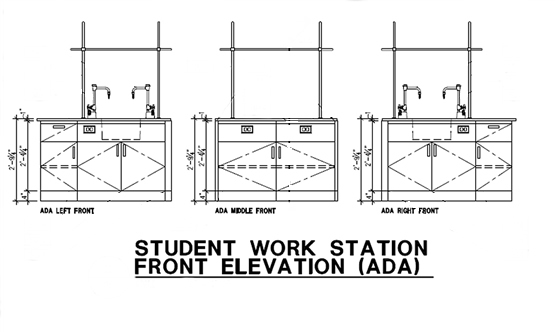 Lengths as indicated on drawings and by assembly model number. B) Upright bars or rods are to be 3/4" (19 mm) diameter, anodized aluminum, 36" (915 mm) long with a rounded top and a tapered bottom to fit rod sockets. C) Clamps are to be 1" (25 mm) square aluminum stock, with two 3/4" (19 mm) diameter openings, at right angles to each other, bored through sides. Openings are upright rods and crossbars. Thumb screw into each end of clamp, tighten against the rods to hold required positions. D) Rod sockets are mushroom type, machined from a solid aluminum rod. Sockets to be held in place by a heavy aluminum lock nut and washer. 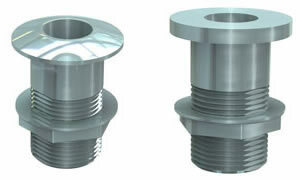 Rod sockets may be either surface mounted or recessed type as desired or specified. 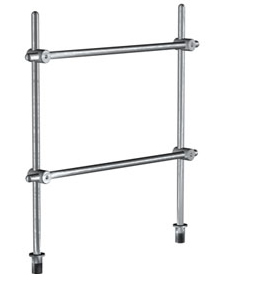 Upright Rod Assembly and Metal Crossbar: Aluminum. 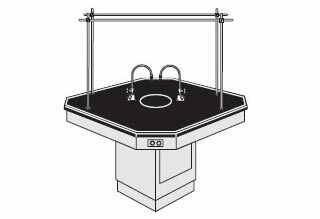 Two vertical rods and one horizontal crossbar, 3/4 inch (19 mm) in diameter and 36 inches (900 mm) long unless otherwise indicated; two flush socket receptacles and two crossbar clamps. Ends of vertical rods are tapered to fit receptacles; all other rod ends are rounded. 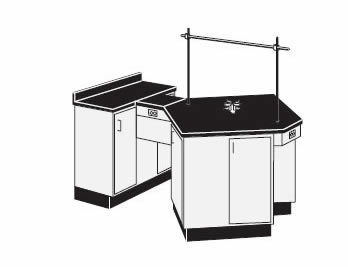 peninsulas and islands, Apparatus Rod Assemblies or Retort Stands will consist of one or two vertical support rods or upright assemblies and one horizontal cross rod, and will be anodized aluminum 3/4" (19mm) diameter and are complete with two burette rod sockets and two ring support clamps, when specified. 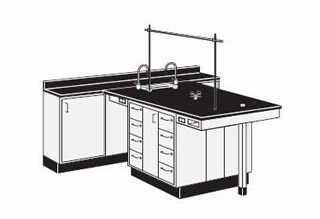 A wide variety of assemblies for installation on laboratory bench tops and instructor demonstration tables made of epoxy resin and solid phenolic resin utilize Apparatus Rod Assemblies. 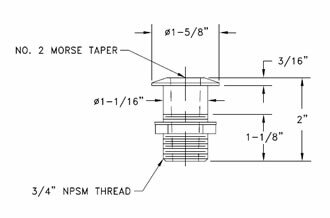 The vertical assembly rods will be tapered at one end to fit into a tapered adapter for flush or recessed receptacle while all other rod ends are rounded. Typical vertical length is 36" (914mm) unless otherwise indicated. Horizontal rods are typically 39" (990mm), unless otherwise called out in specification. Rod Sockets are to be secured through epoxy or solid phenolic table tops with lock nut washer. Rod Clamps are also to be heavy-duty and designed to securely hold all Rod Assemblies in any position. Use of wood assemblies are not acceptable according to code. 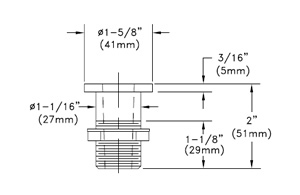 is required when ordering, surface or recess mount. AAP110-024 3/4" dia. x 24" vertical rod. AAP110-036 3/4" dia. x 36" vertical rod. AAP110-039 3/4" dia. x 39" vertical rod. AAP110-048 3/4" dia. x 48" vertical rod. AAP100 Aluminum burette socket for recess mounting. 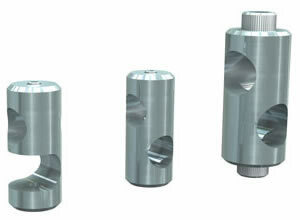 AAP101 Aluminum burette socket for surface mounting. 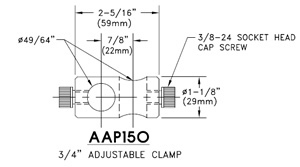 AAP150 Aluminum clamp for 3/4" rods. Horizontal burette rods are 3/4" diameter aluminum rod and are rounded at both ends. AAP155-024 3/4" dia. x 24" horizontal rod. AAP155-036 3/4" dia. x 36" horizontal rod. AAP155-039 3/4" dia. x 39" horizontal rod. AAP155-048 3/4" dia. x 48" horizontal rod. one horizontal aluminum Greenlaw arm 22" to 24" (559mm to 609mm) long x 3/4" (19mm) diameter; and one aluminum thumbscrew clamp and one burette socket.